Bloomsbury, 1997. First edition-15th printing. Hardcover. Good/Good. GC plus.Bloomsbury Publishing,1997.First edition-15th printing(20 19 18 17 16 15).Joanne Rowling is displayed on copyright page.Printed by Clays. Younger Professor Albus Dumbledore at the back of the cover/Dj cover. Pictorial hardback (small nicks and dents on the edges of the cover and spine) with Ddj cover (stain mark and ink marks inside the edges of the Dj cover, tear on the edges of the front Dj cover, small tears, some creases and nicks on the Dj cover), both in GC plus. Clean pages with small ink marks and slightly tainted on the outer edges, a couple of small creases and mark on the edges of the pages, two small marks inside the title page. The book is in GC with some shelf wear on the Dj cover. Winner of the 1997 Smarties Gold Award displayed on the edge of the front cover/Dj cover. 223pp. Price un-clipped. A collectable early printing. Bloomsbury Publishing, 1997. First edition-14th printing. Hardcover. Good/No Dj cover. GC plus.Bloomsbury Publishing,1997.First edition-14th printing (20 19 18 17 16 15 14).Joanne Rowling is displayed on copyright page.Printed by Clays.Pictorial hardback(small nicks and dents on the edges of the cover and spine) in GC, no Dj cover.Clean pages with small ink marks and light shelf wear on the outer edges,a couple of small creases and ink marks on the edges of the pages.The book is in GC with light shelf wear.Winner of the 1997 Smarties Gold Award displayed on the edge of the front cover.Younger Professor Albus Dumbledore at the back of the cover.223pp.Price un-clipped.A collectable early printing but without the Dj cover. Book Description: Harry Potter is an ordinary boy who lives in a cupboard under the stairs at his Aunt Petunia and Uncle Vernon's house, which he thinks is normal for someone like him who's parents have been killed in a 'car crash'. He is bullied by them and his fat, spoilt cousin Dudley, and lives a very unremarkable life with only the odd hiccup (like his hair growing back overnight!) to cause him much to think about. That is until an owl turns up with a letter addressed to Harry and all hell breaks loose! He is literally rescued by a world where nothing is as it seems and magic lessons are the order of the day. Read and find out how Harry discovers his true heritage at Hogwarts School of Wizardry and Witchcraft, the reason behind his parents mysterious death, who is out to kill him, and how he uncovers the most amazing secret of all time, the fabled Philosopher's Stone! All this and muggles too. Now, what are they? This is Jo's first book and she has already written seven outlines for Harry's further adventures at Hogwarts. Bloomsbury, 1997. First edition-28th printing. Paperback. Good. GC plus.Bloomsbury,1997.First edition-28th printing (30 29 28). Paperback(small stain mark on the edges of the back cover, some nicks and creases on the edges of the cover and spine, small tear on the edges of the spine) in GC plus. Joanne Rowling printed on the copyright page,Winner of the 1997 Smarties Gold Award on the front cover. Younger Professor Albus Dumbledore at the back of the cover. Printed by Clays. Clean pages with small ink marks and slightly tainted on the outer edges, small stain marks on the edges of the last three pages of the book and inside the edges of the back cover, a couple of creases and small nicks on the edges of the pages,previous owner's name written inside the edges of the front cover, the front cover and spine are slightly faded. The book is in GC with some shelf wear.223pp. A collectable eraly printing. Bloomsbury Publishing, 2015. First UK edition-first printing. Hardcover. Near fine/Near fine. Near fine condition.Bloomsbury Childrens,2015. First UK edition-first printing of this new illustration edition(1 3 5 7 9 10 8 6 4 2). Large format red hardback(blue lettering to the spine,two small dents on the edges of the cover, small nick on the edges of the front cover) with DJ (a couple of small nicks on the edges of the Dj cover),both in near fine condition.Illustrated with many colour drawings.Illustrations by Jim Kay.Nice and clean pages as new.251pp.Price un-clipped. A collectable first edition-first printing of this illustrated edition. Please note: This is heavy book(approx 1.7 Kg). Bloomsbury Publishing, 1999. First UK edition-5th printing. Hardcover. Very good/No Dj cover as issued. VGC.Bloomsbury,1999.First UK edition-5th printing(10 9 8 7 6 5) of this Deluxe edition.Printed in UK by Clays.Pictorial red hardback(small marks,nicks,dents and scratch on the cover and spine,gilt lettering and illustration on the front cover,gilt lettering to the spine) in VGC, no Dj as issued.Gilted outer edges of the pages.Nice and clean pages with a couple of small ink marks on the outer edges,small crease and ink mark on the edges of the pages.The book is in VGC with light shelf wear.223pp.A collectable early printing. Book Description: Harry Potter is an ordinary boy who lives in a cupboard under the stairs at his Aunt Petunia and Uncle Vernon's house, which he thinks is normal for someone like him who's parents have been killed in a 'car crash'. He is bullied by them and his fat, spoilt cousin Dudley, and lives a very unremarkable life with only the odd hiccup (like his hair growing back overnight!) to cause him much to think about. That is until an owl turns up with a letter addressed to Harry and all hell breaks loose! He is literally rescued by a world where nothing is as it seems and magic lessons are the order of the day. Read and find out how Harry discovers his true heritage at Hogwarts School of Wizardry and Witchcraft, the reason behind his parents mysterious death, who is out to kill him, and how he uncovers the most amazing secret of all time, the fabled Philosopher's Stone! All this and muggles too. Now, what are they?. Bloomsbury, 1997. First edition-23rd printing. Hardcover. Good/No Dj cover. GC plus .Bloomsbury Publishing,1997.First edition-23rd printing (30 29 28 27 26 25 24 23).Joanne Rowling is displayed on copyright page, old Dumbledore at the back of the cover,Triple Smarties Gold Award displayed on the edges of the front cover/Dj cover.Printed by Clays. Pictorial hardback(two small dents and nicks on the edges of the cover and spine) in GC plus. Noi Dj cover with the book. Clean pages with some pen marks, ink mark and slightly yellow on the outer edges,a couple of small nicks and creases on the edges of the pages,previous owner's name written inside the front endpaper. The book is missing the front endpaper page.The book is in GC but without the Dj cover. 223pp. A collectable book. Bloomsbury, 1999. First UK edition-24th printing. Hardcover. Near fine/No Dj cover as issued. Near fine condition.Bloomsbury,1999.First UK edition-24th printing(30 29 28 27 26 25 24) of this Deluxe edition.Printed in UK by Clays.Pictorial red hardback(gilt lettering and illustration on the front cover,gilt lettering to the spine, two small scratches and nick on the edges of the cover) in near fine condition, no Dj as issued.Gilted outer edges of the pages.Nice and clean pages as new with a small ink mark on the outer edges, small nick and ink mark on the edges of the pages.223pp. Book Description: Harry Potter is an ordinary boy who lives in a cupboard under the stairs at his Aunt Petunia and Uncle Vernon's house, which he thinks is normal for someone like him who's parents have been killed in a 'car crash'. He is bullied by them and his fat, spoilt cousin Dudley, and lives a very unremarkable life with only the odd hiccup (like his hair growing back overnight!) to cause him much to think about. That is until an owl turns up with a letter addressed to Harry and all hell breaks loose! He is literally rescued by a world where nothing is as it seems and magic lessons are the order of the day. 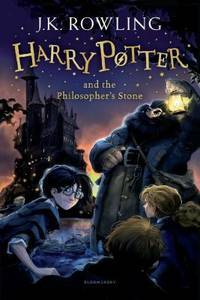 Read and find out how Harry discovers his true heritage at Hogwarts School of Wizardry and Witchcraft, the reason behind his parents mysterious death, who is out to kill him, and how he uncovers the most amazing secret of all time, the fabled Philosopher's Stone! All this and muggles too. Now, what are they? This is Jo's first book and she has already written seven outlines for Harry's further adventures at Hogwarts. Bloomsbury Publishing, 2001. First edition-first printing of this edition. Paperback. Very good. VGC.Bloomsbury,2001.First edition-first printing of this edition(10 9 8 7 6 5 4 3 2 1).Paperback(a couple of creases and small nicks on the edges of the cover and spine) in VGC.Nice and clean pages but slightly tainted on the outer edges,small creases on the edges of the pages, very small mark on the edges of the half-title page of the book.The book is in VGC book with light shelf wear.223pp.A collectable first paperback edition. Bloomsbury, 1999. First UK edition-6th printing. Hardcover. Good/No Dj cover as issued. GC plus.Bloomsbury,1999.First UK edition-6th printing(10 9 8 7 6) of this Deluxe edition.Printed in UK by Clays.Pictorial red hardback(some marks,nicks,dents,crease and ink marks on the cover and spine,very small tear on the edges of the spine,gilt lettering and illustration on the front cover,gilt lettering to the spine) in good condition plus, no Dj as issued.Gilted outer edges of the pages.Clean pages with ink marks and light shelf wear on the outer edges,stain marks on the edges of some of the pages,creases and ink marks on the edges of the pages,previous owner's name written on the edges of the title page.The book is in GC but with some shelf wear.223pp.A collectable early printing. Book Description: Harry Potter is an ordinary boy who lives in a cupboard under the stairs at his Aunt Petunia and Uncle Vernon's house, which he thinks is normal for someone like him who's parents have been killed in a 'car crash'. He is bullied by them and his fat, spoilt cousin Dudley, and lives a very unremarkable life with only the odd hiccup (like his hair growing back overnight!) to cause him much to think about. That is until an owl turns up with a letter addressed to Harry and all hell breaks loose! He is literally rescued by a world where nothing is as it seems and magic lessons are the order of the day. Read and find out how Harry discovers his true heritage at Hogwarts School of Wizardry and Witchcraft, the reason behind his parents mysterious death, who is out to kill him, and how he uncovers the most amazing secret of all time, the fabled Philosopher's Stone! All this and muggles too. Now, what are they? This is Jo's first book and she has already written seven outlines for Harry's further adventures at Hogwarts. Raincoast Book Distribution, 2004. Hardcover. As New. Disclaimer:An apparently unread copy in perfect condition. Dust cover is intact; pages are clean and are not marred by notes or folds of any kind. At ThriftBooks, our motto is: Read More, Spend Less.Dust jacket quality is not guaranteed. Bloomsbury Publishing, 1998. First UK paperback adult edition-9th printing. Paperback. Very good. VGC.Bloomsbury,1998.First UK paperback adult edition-9th printing (10 9). Joanne Rowling is displayed on copyright page. Paperback (a couple of small nicks and crease on the edges of the cover and spine) in VGC. Nice and clean pages with small nicks and slightly yellow on the outer edges, some creases and nicks on the edges of the pages.233pp.A collectable early printing of this adult edition. Bloomsbury, 1997. First edition-43rd printing. Paperback. Very good. VGC.Bloomsbury,1997.First edition-43rd printing (run number 50 to 43). Paperback with protected cover (two small nicks and crease on the edges of the cover and spine) in VGC. Joanne Rowling printed on the copyright page,Winner of the 1997 Smarties Gold Award on the front cover.Printed by Clays.Nice and clean pages with a small ink mark and light shelf wear on the outer edges, a couple of small nicks on the edges of the pages, previous owner's own label inside the edges of the front cover..The book is in VGC with light shelf wear.223pp.A collectable book. Book Description: Harry Potter is an ordinary boy who lives in a cupboard under the stairs at his Aunt Petunia and Uncle Vernon's house, which he thinks is normal for someone like him who's parents have been killed in a 'car crash'. He is bullied by them and his fat, spoilt cousin Dudley, and lives a very unremarkable life with only the odd hiccup (like his hair growing back overnight!) to cause him much to think about. That is until an owl turns up with a letter addressed to Harry and all hell breaks loose! He is literally rescued by a world where nothing is as it seems and magic lessons are the order of the day. Read and find out how Harry discovers his true heritage at Hogwarts School of Wizardry and Witchcraft, the reason behind his parents mysterious death, who is out to kill him, and how he uncovers the most amazing secret of all time, the fabled Philosopher's Stone! All this and muggles too. Now, what are they? This is Jo's first book and she has already written seven outlines for Harry's further adventures at Hogwarts. Bloomsbury, 2001. First edition-34th printing of this edition. Paperback. Near fine. Near fine condition.Bloomsbury,2001.First edition-34th printing of this edition(34).Paperback(two small nicks and crease on the edges of the cover and spine) in near fine condition.Nice and clean pages with two small ink marks on the outer edges, a couple of nicks and crease on the edges of the pages. 223pp. Book Description: Harry Potter is an ordinary boy who lives in a cupboard under the stairs at his Aunt Petunia and Uncle Vernon's house, which he thinks is normal for someone like him who's parents have been killed in a 'car crash'. He is bullied by them and his fat, spoilt cousin Dudley, and lives a very unremarkable life with only the odd hiccup (like his hair growing back overnight!) to cause him much to think about. That is until an owl turns up with a letter addressed to Harry and all hell breaks loose! He is literally rescued by a world where nothing is as it seems and magic lessons are the order of the day. Read and find out how Harry discovers his true heritage at Hogwarts School of Wizardry and Witchcraft, the reason behind his parents mysterious death, who is out to kill him, and how he uncovers the most amazing secret of all time, the fabled Philosopher's Stone! All this and muggles too. Now, what are they? This is Jo's first book and she has already written seven outlines for Harry's further adventures at Hogwarts. Bloomsbury Publishing, 1997. First edition-32nd printing. Paperback. Very good. VGC plus.Bloomsbury,1997.First edition-32nd printing(32).Paperback(two small nicks and crease on the edges of the cover and spine) in VGC plus.Nice and clean pages with a small mark and light shelf wear on the outer edges, a couple of small creases on the edges of the pages.The book is in VGC plus with light shelf wear.Joanne Rowling printed on the copyright page,Winner of the 1997 Smarties Gold Award on the front cover.Printed by Clays.223pp.A collectable book. Book Description: Harry Potter is an ordinary boy who lives in a cupboard under the stairs at his Aunt Petunia and Uncle Vernon's house, which he thinks is normal for someone like him who's parents have been killed in a 'car crash'. He is bullied by them and his fat, spoilt cousin Dudley, and lives a very unremarkable life with only the odd hiccup (like his hair growing back overnight!) to cause him much to think about. That is until an owl turns up with a letter addressed to Harry and all hell breaks loose! He is literally rescued by a world where nothing is as it seems and magic lessons are the order of the day. Read and find out how Harry discovers his true heritage at Hogwarts School of Wizardry and Witchcraft, the reason behind his parents mysterious death, who is out to kill him, and how he uncovers the most amazing secret of all time, the fabled Philosopher's Stone! All this and muggles too. Now, what are they? This is Jo's first book and she has already written seven outlines for Harry's further adventures at Hogwarts. Bloomsbury Childrens, 1997. First edition-60th printing. Paperback. Very good. Near fine condition.Bloomsbury,1997.First edition-60th printing(60).Paperback(small nick on the edges of the cover) in near fine condition.Nice and clean pages with a small ink mark and nick on the edges of the pages,small pencil mark impression on the edges of the half-title page.Nice and clean book.Triple Smarties Gold Award Winner on the front cover.Printed by Clays.223pp. Bloomsbury Childrens, 2014. 14th printing of this new edition. Hardcover. New/New. Mint condition.Bloomsbury,2014.14th printing of this new edition (14).Purple hardback(gilt lettering to the spine) with an illustrated Dj(small nick on the edges of the Dj cover), both in mint condition.Illustrated with a b/w map.Map illustration by Tomislav Tomic.The book is new.336pp. Book Description: Harry Potter is an ordinary boy who lives in a cupboard under the stairs at his Aunt Petunia and Uncle Vernon's house, which he thinks is normal for someone like him who's parents have been killed in a 'car crash'. He is bullied by them and his fat, spoilt cousin Dudley, and lives a very unremarkable life with only the odd hiccup (like his hair growing back overnight!) to cause him much to think about. That is until an owl turns up with a letter addressed to Harry and all hell breaks loose! He is literally rescued by a world where nothing is as it seems and magic lessons are the order of the day. Read and find out how Harry discovers his true heritage at Hogwarts School of Wizardry and Witchcraft, the reason behind his parents mysterious death, who is out to kill him, and how he uncovers the most amazing secret of all time, the fabled Philosopher's Stone! All this and muggles too. Now, what are they? This is Jo's first book and she has already written seven outlines for Harry's further adventures at Hogwarts. Bloomsbury Publishing, 1997. First edition-48th printing. Paperback. Near fine. Near fine condition.Bloomsbury,1997.First edition-48th printing(50 49 48).Paperback(small nick and crease on the edges of the cover and spine) in near fine condition.Nice and clean pages with a couple of small creases and nicks on the edges of the pages.Joanne Rowling printed on the copyright page,Triple Smarties Gold Award Winner on the front cover.Printed by Clays.223pp. Book Description: Harry Potter is an ordinary boy who lives in a cupboard under the stairs at his Aunt Petunia and Uncle Vernon's house, which he thinks is normal for someone like him who's parents have been killed in a 'car crash'. He is bullied by them and his fat, spoilt cousin Dudley, and lives a very unremarkable life with only the odd hiccup (like his hair growing back overnight!) to cause him much to think about. That is until an owl turns up with a letter addressed to Harry and all hell breaks loose! He is literally rescued by a world where nothing is as it seems and magic lessons are the order of the day. Read and find out how Harry discovers his true heritage at Hogwarts School of Wizardry and Witchcraft, the reason behind his parents mysterious death, who is out to kill him, and how he uncovers the most amazing secret of all time, the fabled Philosopher's Stone! All this and muggles too. Now, what are they? This is Jo's first book and she has already written seven outlines for Harry's further adventures at Hogwarts. Bloomsbury Publishing, 1997. First edition-33rd printing. Paperback. Very good. VGC.Bloomsbury,1997.First edition-33rd printing.Paperback(small nicks and creases on the edges of the cover and spine, very small tear on the edges of the spine ) in VGC.Joanne Rowling printed on the copyright page,Winner of the 1997 Smarties Gold Award on the front cover.Printed by Clays.Nice and clean pages with a small mark,ink marks and slightly tainted on the outer edges, a couple of small nicks on the edges of the pages.The book is in VGC with light shelf wear.223pp.A collectable book. Book Description: Harry Potter is an ordinary boy who lives in a cupboard under the stairs at his Aunt Petunia and Uncle Vernon's house, which he thinks is normal for someone like him who's parents have been killed in a 'car crash'. He is bullied by them and his fat, spoilt cousin Dudley, and lives a very unremarkable life with only the odd hiccup (like his hair growing back overnight!) to cause him much to think about. That is until an owl turns up with a letter addressed to Harry and all hell breaks loose! He is literally rescued by a world where nothing is as it seems and magic lessons are the order of the day. Read and find out how Harry discovers his true heritage at Hogwarts School of Wizardry and Witchcraft, the reason behind his parents mysterious death, who is out to kill him, and how he uncovers the most amazing secret of all time, the fabled Philosopher's Stone! All this and muggles too. Now, what are they? This is Jo's first book and she has already written seven outlines for Harry's further adventures at Hogwarts. Bloomsbury Publishing, 1997. First edition-45th printing. Paperback. Near fine. Near fine condition.Bloomsbury,1997.First edition-45th printing(50 49 48 47 46 45).Paperback(small nick and crease on the edges of the cover and spine) in near fine condition.Nice and clean pages with a couple of small creases and nicks on the edges of the pages.Joanne Rowling printed on the copyright page,Triple Smarties Gold Award Winner on the front cover.Printed by Clays.223pp. Book Description: Harry Potter is an ordinary boy who lives in a cupboard under the stairs at his Aunt Petunia and Uncle Vernon's house, which he thinks is normal for someone like him who's parents have been killed in a 'car crash'. He is bullied by them and his fat, spoilt cousin Dudley, and lives a very unremarkable life with only the odd hiccup (like his hair growing back overnight!) to cause him much to think about. That is until an owl turns up with a letter addressed to Harry and all hell breaks loose! He is literally rescued by a world where nothing is as it seems and magic lessons are the order of the day. Read and find out how Harry discovers his true heritage at Hogwarts School of Wizardry and Witchcraft, the reason behind his parents mysterious death, who is out to kill him, and how he uncovers the most amazing secret of all time, the fabled Philosopher's Stone! All this and muggles too. Now, what are they? This is Jo's first book and she has already written seven outlines for Harry's further adventures at Hogwarts. Bloomsbury Publishing, 1997. First edition-64th printing. Paperback. Near fine. Near fine condition.Bloomsbury,1997.First edition-64th printing (64).Paperback(two small nicks, scratch and crease on the edges of the cover and spine) in near fine condition.Nice and clean pages with light shelf wear on the outer edges, two small nicks and ink mark on the edges of the pages,Triple Smarties Gold Award Winner on the front cover.Printed by Clays.223pp. Book Description: Harry Potter is an ordinary boy who lives in a cupboard under the stairs at his Aunt Petunia and Uncle Vernon's house, which he thinks is normal for someone like him who's parents have been killed in a 'car crash'. He is bullied by them and his fat, spoilt cousin Dudley, and lives a very unremarkable life with only the odd hiccup (like his hair growing back overnight!) to cause him much to think about. That is until an owl turns up with a letter addressed to Harry and all hell breaks loose! He is literally rescued by a world where nothing is as it seems and magic lessons are the order of the day. Read and find out how Harry discovers his true heritage at Hogwarts School of Wizardry and Witchcraft, the reason behind his parents mysterious death, who is out to kill him, and how he uncovers the most amazing secret of all time, the fabled Philosopher's Stone! All this and muggles too. Now, what are they? This is Jo's first book and she has already written seven outlines for Harry's further adventures at Hogwarts. BLOOMSBURY CHILDREN', 2004. Hardcover. Good. Disclaimer:A copy that has been read, but remains in clean condition. All pages are intact, and the cover is intact. The spine may show signs of wear. Pages can include limited notes and highlighting, and the copy can include previous owner inscriptions. At ThriftBooks, our motto is: Read More, Spend Less.Dust jacket quality is not guaranteed. Bloomsbury Publishing, 1997. First edition-76th printing. Paperback. Near fine. Near fine condition.Bloomsbury,1997.First edition-76th printing(85 to 76).Paperback(two small nicks and crease on the edges of the cover and spine) in near fine condition.Nice and clean pages with a small mark on the outer edges,two small creases and nicks on the edges of the pages. Triple Smarties Gold Award Winner on the front cover.Printed by Clays.223pp. Book description: Harry Potter is an ordinary boy who lives in a cupboard under the stairs at his Aunt Petunia and Uncle Vernon's house, which he thinks is normal for someone like him who's parents have been killed in a 'car crash'. He is bullied by them and his fat, spoilt cousin Dudley, and lives a very unremarkable life with only the odd hiccup (like his hair growing back overnight!) to cause him much to think about. That is until an owl turns up with a letter addressed to Harry and all hell breaks loose! He is literally rescued by a world where nothing is as it seems and magic lessons are the order of the day. Read and find out how Harry discovers his true heritage at Hogwarts School of Wizardry and Witchcraft, the reason behind his parents mysterious death, who is out to kill him, and how he uncovers the most amazing secret of all time, the fabled Philosopher's Stone! All this and muggles too. Now, what are they? This is Jo's first book and she has already written seven outlines for Harry's further adventures at Hogwarts. Raincoast Books, 2002. Paperback. Acceptable. Disclaimer:A readable copy. All pages are intact, and the cover is intact. Pages can include considerable notes-in pen or highlighter-but the notes cannot obscure the text. At ThriftBooks, our motto is: Read More, Spend Less.Dust jacket quality is not guaranteed. Bloomsbury Paperbacks, 2013. Paperback. Very Good. Disclaimer:A copy that has been read, but remains in excellent condition. Pages are intact and are not marred by notes or highlighting, but may contain a neat previous owner name. The spine remains undamaged. At ThriftBooks, our motto is: Read More, Spend Less.Dust jacket quality is not guaranteed. Bloomsbury Paperbacks, 2013. Paperback. Good. Disclaimer:A copy that has been read, but remains in clean condition. All pages are intact, and the cover is intact. The spine may show signs of wear. Pages can include limited notes and highlighting, and the copy can include previous owner inscriptions. At ThriftBooks, our motto is: Read More, Spend Less.Dust jacket quality is not guaranteed. Manjul Publishing House Pvt. Ltd., 2014-05-12. Bloomsbury Pub Ltd, 2000. Perfect Paperback. Very Good No DJ. 4.4 x 1 x 7.0 inches. Pages are unmarked by previous owners, pages are slightly beginning to yellow in margins. Binding is sound, but spine is creased. Covers are clean, creasing and curling at corners. Text block is clean. PICTURES PROVIDED UPON REQUEST. Munhak Sucheob, 2000. Paperback. Acceptable. Disclaimer:A readable copy. All pages are intact, and the cover is intact. Pages can include considerable notes-in pen or highlighter-but the notes cannot obscure the text. At ThriftBooks, our motto is: Read More, Spend Less.Dust jacket quality is not guaranteed. Raincoast Books, 2000. Hardcover. Acceptable. Disclaimer:A readable copy. All pages are intact, and the cover is intact. Pages can include considerable notes-in pen or highlighter-but the notes cannot obscure the text. At ThriftBooks, our motto is: Read More, Spend Less.Dust jacket quality is not guaranteed. Bloomsbury, 2000. Paperback. Acceptable. Disclaimer:A readable copy. All pages are intact, and the cover is intact. Pages can include considerable notes-in pen or highlighter-but the notes cannot obscure the text. The dust jacket is missing. At ThriftBooks, our motto is: Read More, Spend Less. Bloomsbury Publishing, 2011. Paperback. Good. Disclaimer:A copy that has been read, but remains in clean condition. All pages are intact, and the cover is intact. The spine may show signs of wear. Pages can include limited notes and highlighting, and the copy can include previous owner inscriptions. At ThriftBooks, our motto is: Read More, Spend Less.Dust jacket quality is not guaranteed. Bloomsbury, 2014. Paperback. Acceptable. Disclaimer:A readable copy. All pages are intact, and the cover is intact. Pages can include considerable notes-in pen or highlighter-but the notes cannot obscure the text. At ThriftBooks, our motto is: Read More, Spend Less.Dust jacket quality is not guaranteed. Raincoast Books, 2004. Mass Market Paperback. Good. Disclaimer:A copy that has been read, but remains in clean condition. All pages are intact, and the cover is intact. The spine may show signs of wear. Pages can include limited notes and highlighting, and the copy can include previous owner inscriptions. At ThriftBooks, our motto is: Read More, Spend Less.Dust jacket quality is not guaranteed. Raincoast Books, 2004. Mass Market Paperback. Acceptable. Disclaimer:A readable copy. All pages are intact, and the cover is intact. Pages can include considerable notes-in pen or highlighter-but the notes cannot obscure the text. At ThriftBooks, our motto is: Read More, Spend Less.Dust jacket quality is not guaranteed. Raincoast Books, 2002. Paperback. Good. Disclaimer:A copy that has been read, but remains in clean condition. All pages are intact, and the cover is intact. The spine may show signs of wear. Pages can include limited notes and highlighting, and the copy can include previous owner inscriptions. At ThriftBooks, our motto is: Read More, Spend Less.Dust jacket quality is not guaranteed. Bloomsbury, 2000. Paperback. Good. Disclaimer:A copy that has been read, but remains in clean condition. All pages are intact, and the cover is intact. The spine may show signs of wear. Pages can include limited notes and highlighting, and the copy can include previous owner inscriptions. The dust jacket is missing. At ThriftBooks, our motto is: Read More, Spend Less. Bloomsbury, 2014. Paperback. Good. Disclaimer:A copy that has been read, but remains in clean condition. All pages are intact, and the cover is intact. The spine may show signs of wear. Pages can include limited notes and highlighting, and the copy can include previous owner inscriptions. At ThriftBooks, our motto is: Read More, Spend Less.Dust jacket quality is not guaranteed.